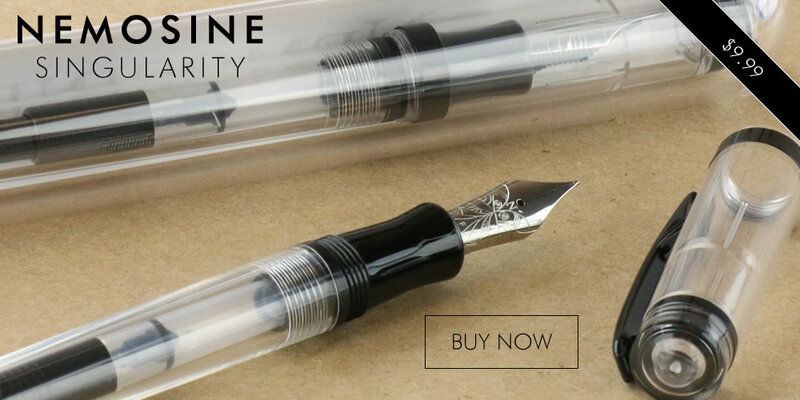 We have discounted the Nemosine Singularity fountain pens while supplies last. These pens retail for $24.99 and are on sale for $9.99. Great starter pens, available in an assortment of great colors. Not a single option with either an Extra Fine or a 0.6mm Stub nib in sight, though. You can just buy the nibs separately too. The 0.8 stub and broad are great, great nibs too. Kevin's F nib runs a little on the fine side for western nibs, closer to a sailor FM. I don't know how kevin sells these pens so cheaply with such great quality control. I have 3 singularities, one clear blue, one solid blue, and one in the lovely coral finish. Edited by Honeybadgers, 10 November 2018 - 04:34. Not seeing any #6 replacement Extra Fine or Stub nibs being listed either. *edit* I found them on pen chalet, here. They don't have stubs, but do have the EF. You're in upside-down world, so I don't know about shipping or other retailers, but you can contact kevin at nemosine directly, the nibs are also available from Goulet (who also has the singularity on heavy discount, though they're out of stock of all the discounted models) and we can find them on Amazon. Nemosine #5 and #6 nibs are my go-to for every replacement pen that just needs a great writing steel nib. Kevin gives every nib at least a looking over and if necessary a little tweaking before sending out. Edited by Honeybadgers, 10 November 2018 - 09:41. Order placed. So much for my 3 month hiatus from purchasing pen and ink supplies. *edit* I found them on pen chalet, here. OK, I tried placing one item in the cart on the Nemosine site, then went to checkout, just to see how much shipping would be. There is one shipping rate available for 2000, New South Wales, Australia. so I don't think I'll be ordering. Now, don't get me wrong, I'm not saying any of the well established retailers are necessarily profiteering from the shipping charges, but at US$46.08 ≈ $64 of my money, I'd prefer to buy two more Moonman M100 on AliExpress... or spend a few dollars more and get a Platinum #3776 Century 'Black in Black' with EF nib from Amazon.co.jp (¥5,699 ≈ US$49.98 at present) and tack that onto my upcoming shipment via a Japanese re-shipper at marginal cost-by-weight. Edited by A Smug Dill, 12 November 2018 - 08:56.